There’s been a lot of talk in the news lately about the dangers of sitting for long periods of time. Not only is there a correlation between long periods of sitting and chronic disease, sitting for 11 or more hours a day correlates with increased risk of death. Even regular exercise doesn’t seem to offset the risk. 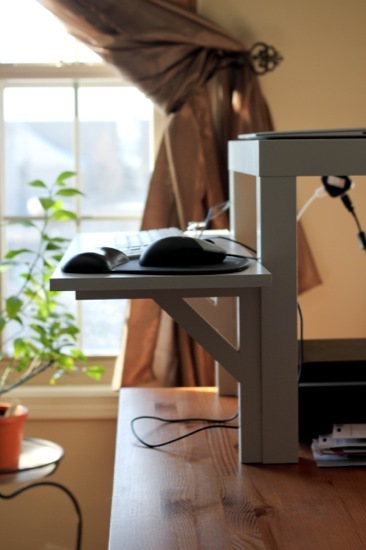 Anyhoo, I spend a lot of my day working in front of a computer, and so I’ve had the idea for a standing desk in the back of my mind for a while. 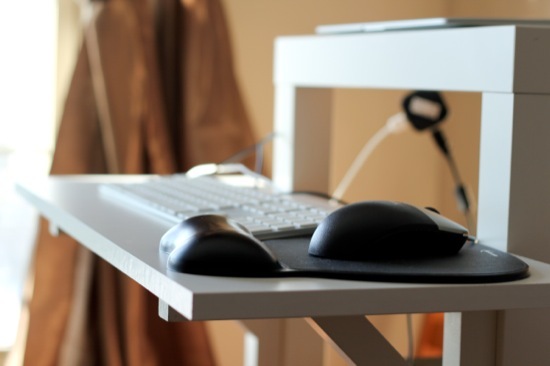 I’d done some preliminary research on standing desks a few months ago and was shocked at how much they cost. Check out the slideshow at the bottom of this page for examples. Yeah, I don’t have $1000+ to spend on a standing desk, thank you very much. 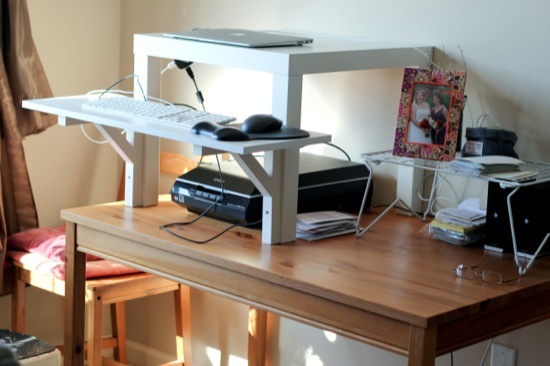 Then Peter came across this webpage outlining how to build your own standing desk for $22. Yes, please! *Screws (will cost more if you don’t have any already). The assembly instructions are about 1/4 of the way down this page. Note that the instructions assume you have your own sitting desk already. Unfortunately, Ikea doesn’t ship these parts, so you’ll have to go in person to pick them up. Alternatively, you may find similar parts at another store. Peter and I picked up the parts at the New Haven Ikea while we were in Connecticut over Christmas. I ended up getting a slightly larger shelf (ANTONIUS, $1 more in store) and different brackets (EKBY STILIG, same price) because I wanted my desk to be all one color, and I didn’t want that color to be bright red. Peter and I bought two LACK tables each so that we’d have a larger work surface, plus an extra setup for Peter’s office at school, so that’s six tables, six brackets, and three shelves = three double standing desks for $103.94 + tax. Not too shabby! I’m in the middle of digitizing my family’s old pics, hence the scanner underneath the LACK table. I stacked my laptop on a book to bring it more toward eye level. I’ll probably add another one, or use the wire frame to the right of the LACK table. I’ve been using this desk for about a week now and I love it! My posture has improved and, surprisingly, I feel less tired after a bout of computer work than I did before. Of course, if you have trouble standing or have been advised not to stand for long periods of time, I would not try this or any standing desk. 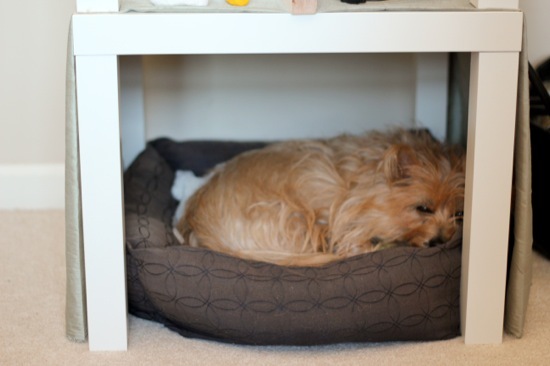 I keep a stool under my desk (you can see it in the bottom of the above picture) to relax my legs every so often. Just like sitting for long periods of time has been tied to health troubles, standing for long periods of time may have negative consequences we don’t know about yet. Moderation, y’all. Peter also went with the all-white setup for his home desk, but for his school office, he’s going for a black-tan-bright red combination. I’ll take a picture after we set it up. 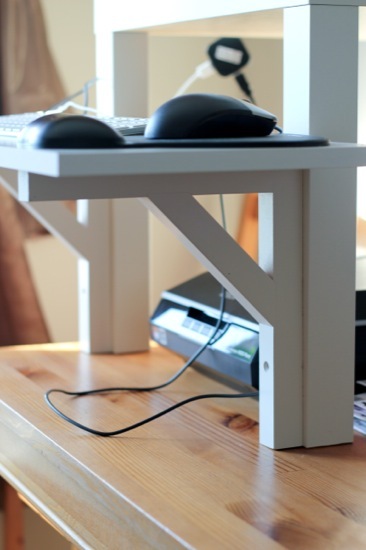 So, what if you can’t build or buy a standing desk? Check out ways to increase your daily movements at the bottom of this page. See you Friday, dear reader! 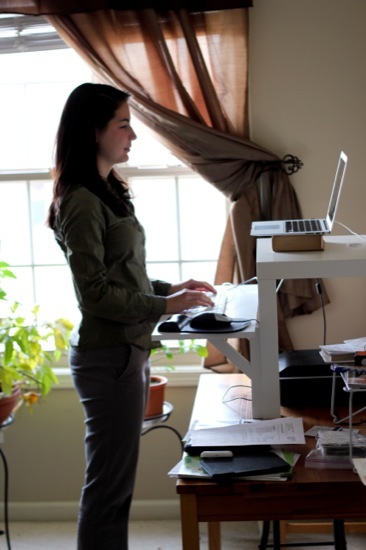 Q: Have you ever tried a standing desk? What do you do to increase your movements during the day? I thank the heavens every day that working in a lab means that I’m running around and doing experiments and standing up constantly…I’d go crazy if I had to sit all day long! 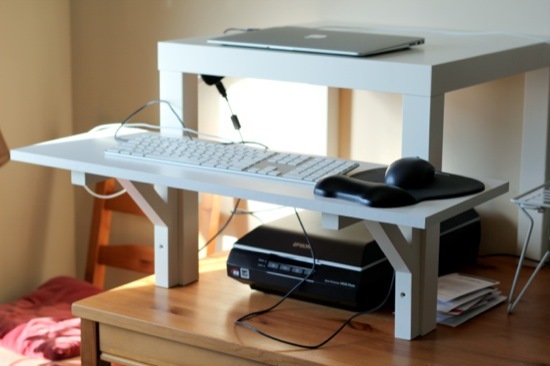 The standing desk IS a great idea though! This is so cool! I’m very impressed that you guys set it all up yourselves! I’ve never tried a standing desk but I can never sit still for too long anyway so hopefully I’m integrating enough movement into each day. Wow, that is such a great idea! And good job putting it together. Way to save money but still get what you wanted! I have a Gaiam ball chair to help with posture and core use while doing desk work. It is helpful, but you can still sit in it with poor posture. I try to walk around when I can. I’m a therapist so I’ll sit still for 45-50 minutes straight, so in between sessions I’m hopping around my office and moving things around. I do my session notes on my iPad, and I’ve been thinking about doing them standing up so it isn’t more time sitting. I also take breaks during the day to walk my dogs and having that movement in the middle of the day is SO helpful. Great ideas, Megan! I like the idea of doing some standing during sessions – I may try it! Hi Christa! Your comment about your clinic made me laugh – so very proper! 😉 The most weight I ever put on at once was my first job out of college (a desk job) – funny how I never moved around but was still so tired at the end of the day! nice job jessie. looks comfortable! That’s awesome! I love that idea. That would not work for me at work because I have people in my office and I would hate to be towering over them, and at home I would be all for it, but I have vertigo and I would fear for my life lol! But, I do stand whenever I can and it makes people nervous. Like in waiting rooms, if I have been sitting all day I will stand for 15-20 minutes. I now have a fitbit one so I can easily see if I am making it to 10,000 steps a day (if I go to the gym it’s a lot more!) and I walk around the office as much as possible. 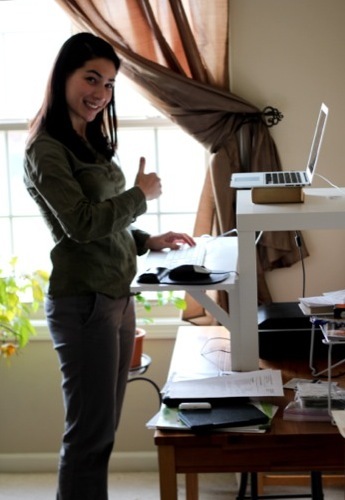 I definitely think your standing desk rocks and you rock for using it! Thanks, Melinda! I know what you mean about standing making people nervous, especially in places where people don’t usually stand! According to Peter, people stand during talks at work, which I think is a great trend (and helps to normalize it). So great! I love standing while writing. 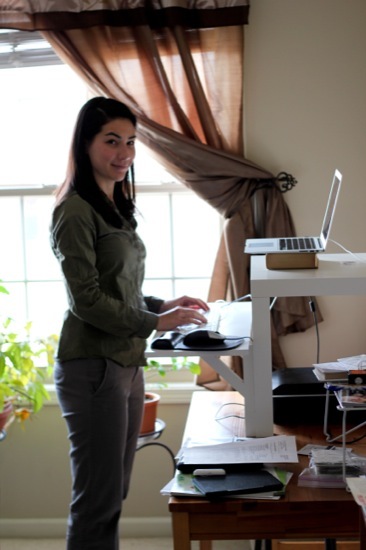 Where I work, I have a standing desk (thank goodness!) I feel so much better after a day of work than when I used to sit in a cubicle all day long. Thank you for sharing! I remember when you made that – it was awesome. LOVE IT!! Actually, funny story…I was at work the other day and I walked past someone’s office and noticed they had one of these!! Yep, but it was wooden. I have her a HUGE pat on the back, I think it’s awesome.